This week, the Sotomayor hearings have begun. I don’t know how much this historic event is on everyone else’s minds around the country, although I hear that only 43% of Americans even know who Sotomayor is. Which means most Americans could care less about the confirmation hearings. But I live in Washington, so it’s the talk of the town this week. Oh, and the talk of Tweeters the world over. Since I can’t just watch TV all day at work (although I did keep CSPAN on in the background on mute for effect! ), Twitter has been my primary source of coverage of the Sotomayor hearings. And really, when you have Twitter, who needs C-SPAN? I have learned everything I need to know about the Sotomayor hearings from the oft-loathed Twitter. Old media, you should be worrying. 12:13 pm: AnaMarieCox: Coburn endorses SS as “a better judge than some but not as good as others.” Well, said, Dr. Obvious. 2:32: mikemadden: Abortion protesters getting very half-hearted: Lady yells, “You’re wrong, Sotomayor,” but she was already on her way out of the room. 2:58: AmandaCarpenter: Sotomayor’s mom is crying. I remember Alito’s wife crying for much different reasons the last time we confirmed a judge. 3:04: AmandaCarpenter: #Sotoshow is over! Chris Matthews says he knows he shouldn’t say this, but he’s “feeling one of those thrills again” No joke. 11:15 am: HowardKurtz: Sotomayor says Roe is settled law. That is a big deal. Most of the cable channels weren’t live and are now going back to it. 11:16: NishaChittal: Something tells me the right-wing blogosphere is going to go nuts over this “settled law” comment. 11:44: AnaMarieCox: #sotoshow DISCUSSION OF NUNCHUCKS FTW! 4:44: rkref: What is Graham doing with these questions about 9/11. She lives blocks from ground zero, asshat. She wasn’t in SOUTH CAROLINA on 9/11. 4:46: mikemadden: Lindsey Graham’s questions to #Sotomayor were, basically: Why does everyone hate you? Aren’t you lucky you’re not white? Isn’t al-Qaida bad? 5:52 pm: rkref: Roger Simon says Lindsey Graham was a condescending gamecock today bc Rush Limbaugh beat him up on his show. Pathetic. 10:15: OKnox: Wait a moment. I think @OrrinHatch may have just filed the first Senatorial tweet from the #Sotomayor hearings (Unless that’s staff). 10:30: mikemadden: Coburn: “Let’s say I’m 38 weeks pregnant.” Hell of a way to make an announcement like that, Senator. 12 pm: cbellantoni: Things I learned today, #sotoshow edition: #Sotomayor a fan of Perry Mason. 2:30 pm: jdickerson: Senator Coburn says “Americans want to see what your gut says,” but I though it was wrong to pick a judge based on gut? 4 pm: OKnox: Grassley now asking #Sotomayor to comment on merits of Defense of Marriage Act. She says matter is pending or impending b4 SCOTUS. Twitter coverage of the Sotomayor hearings does lead me to wonder where the substance is, since you can’t learn much more from this than who made what dumb joke. But I think the point is that the whole event, from what I can see, has turned into pure political theater. 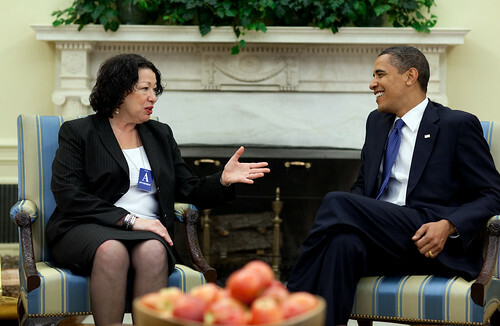 Unless Sotomayor has a “complete meltdown,” as Sen. Graham said, she’s going to get confirmed. So all the TV, cable news, and Twitter hoopla is mostly for show. And for fun.